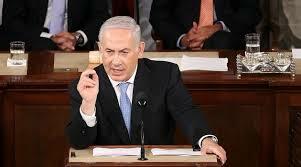 Even at those points where Israeli Prime Minister Netanyahu’s speech was correct, his words offended our nation. If Netanyahu’s plan was to sway American opinion to his side, on the grand matter at hand — a deal with Iran — he failed. He swayed no opinion to his side that he did not already have, and he alienated many — this writer included — who before his speech had been inclined to support his policy. Without informing the President, or obtaining his approval, the Congress invited Netanyahu to speak from the legislative rostrum — from the podium at which our nation’s elected speak — and Netanyahu was crass enough to accept. It was, to me, an offending sight. It is up to OUR leaders, not foreign ones, to form OUR nation’s policy. . The speech hurt, because Israel is a close and dear ally, a sister democracy, more or less, sited in the heart of the most troubled part of the world, in which it stands — so we imagine — as a rare (though not unique) island of relative calm and tolerance. American Jews support Israel financially and passionately, and they vote in key states. This gives Israel a ready-made constituency in America — upon which Netanyahu called because it is there, and because Netanyahu seems to feel that every ew, everywhere, is, or will soon be, an israeli. He has called for European Jews to leave and come to Israel. One was almost surprised that he did not call for American Jews to do the same. Let me say this ; we get that netanyahu doesn’t want us to reach a deal with Iran. we get that he doesn’t trust Iran, that he would go to war with Iran in a heartbeat if he felt he had to. 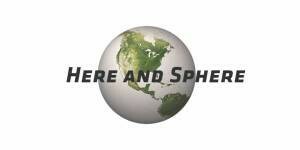 This edge of war can NOT be America’s policy. On some points that he spoke to, Netanyahu is right. A deal on nuclear power with Iran will, as he asserts, probably lead to an arms race in the Middle East. He is also right that iran’s Hezbollah proxies would love to wipe Israel off the map. as for his other assertions, i find them unlikely at best, even false. There is almost no chance that Iran would drop nuclear bombs on Israel. Iran’s top leaders talk plenty of daft crap, and some of them lie; but they act quite realistically. They know very well what that would bring down upon them. For the same reason it’s highly unlikely that Iran would hand over any nuclear weapons to Hezbollah. I also reject his assertion that Iran is Israel’s worst nightmare. Sunni extremism seems far worse and ar more numerous. The Shias of Iran number abiout ten percent tof all Muslims. They’re as much a minority as is Israel. Right now we are fighting the vicious Sunni extremists of ISIS. So is Iran. In this context, a deal with Iran makes long term, deep sense. Besides : if we don’t make a deal with Iran, Russia will. That we cannot allow. For all of these profound diplomatic conundrums Netanyahu has no feasible answer. There is also duplicity in his chutzpah. at war with the thugs o hams several months ago, he did not crush tem utterly when he had the best possible opportiunhioty, Egypt being on his side in the fight. hams use hatred of israel as an excuse to oppress the people of Gaza horribly. thry need to go. Why did Netanyahu not finish tem off ? If he left the cancer of Hamas right trhere, on Israel’s borders, to grow back again, why can’t we make a deal with Iran that will bring much co-operation in a fight all of us need to win ? Netanyahu also said nothing about the poloicies that his conservativex pursue domestically within Israel. that was wise, because these policies cannot be pleasing to k,0ost Americans. He has proposed a law whivh will make Israel officially a Hewish dstate –leving iots two million Druze, bedouins, palestinina,s amd Christians more or les foreigners in the nation they’re citizens of. His settler allies ruthlessly commandeer Palestinans lands and sometimes throw violence; they’re every bit as fatantic as Hamas. His rabbinic allies arrogate to themselves the right to say who is a Jew and who isn’t; they sometimes refuse to sanction marriage between Jews and non Jews; and some of the more extreme have no problem with segregat8ing women at worship. I find very little difference between such practices and the dictates of Salafist islam and its rigid Sharia justice. Israel was not iounded to be a theocratic, tribally exclusive dictatorship. Netanyahu has presided over an almost miraculous, close alliance with the Kurdss, the region’s solidest fighters agianst sunni terror. Yet the Kurds currently live by all the cultural diversity, female equality, religious tolerance, and shrewdly nuanced couraghe that Netanyahu seems to have lost sight of. It is the Kurds who today spearhead the idealism of most of the region’s non-Shia Muslim youth and even of soem Jews. Of this Netanyahu did not talk. He faces an election in two weeks, and right now he looks as if he might lose to a Labor coalition jsut as dedicated to defending Israel as he professes, with none of the tribal and theocratic baggage that drives Netanyahu’s apocalpytic propheices. It would be ironic if Netanyahu lost control of his own nation’s policy so soon after trying to grab hold of ours. 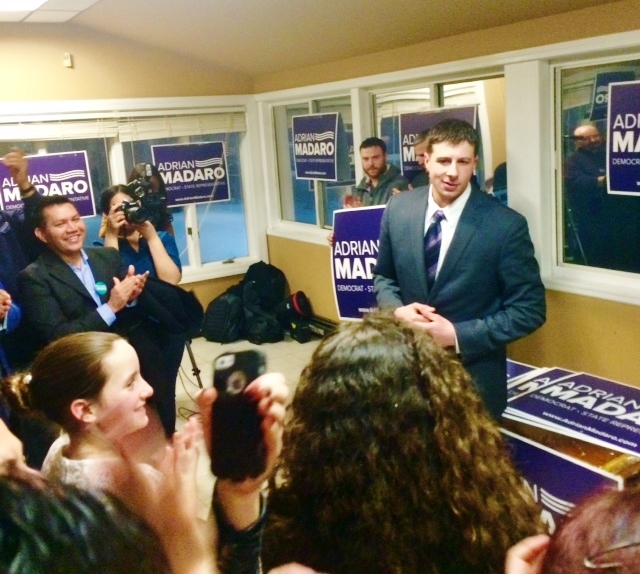 With Carlo Basile — for whom he had been chief of staff — standing behind him, Adrian Madaro, barely 26 years old, celebrated his win in yesterday’s 1st Suffolk State Representative District primary. Even in campaign mode Madaro exults loudly; claiming victory, his voice sounded like a solid object. 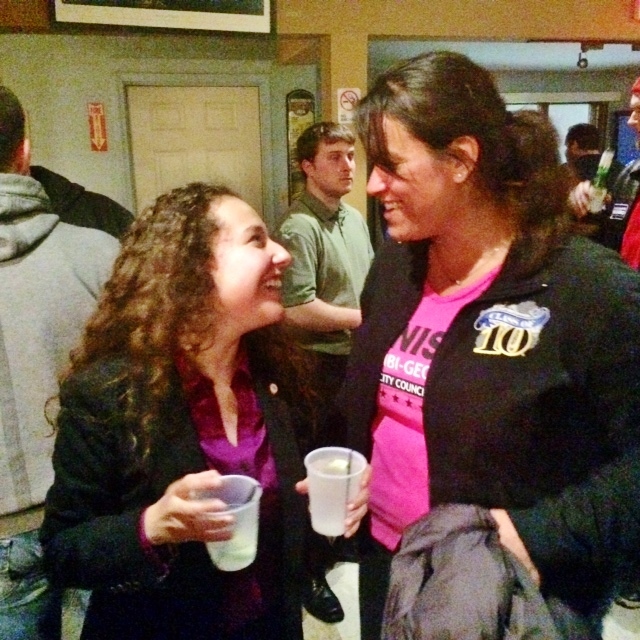 Someone in the wall to wall crowd at East Boston Yacht Club said, “this is a great night or Carlo !” It was; but Basile calmly waved that sentiment off. “No, no, this is Adrian’s night,” he said, in a voice as quiet as Madaro’s voice flaunts decibels. Madaro then dove into the crowd, hugging many, shaking hands, embracing and thanking. It was indeed his night. He won 1498 votes to Ruggiero’s 1140 — a solid margin — finishing no lower than second in any of East Boston’s 14 voting precincts. (Of the other three candidates, Ed Deveau — a Beacon Hill staffer for state senatior Anthony Petrucelli — won 570 votres, with Lou Scapicchio and Camilo Hernandez drawing 174 and 173 respectively.) 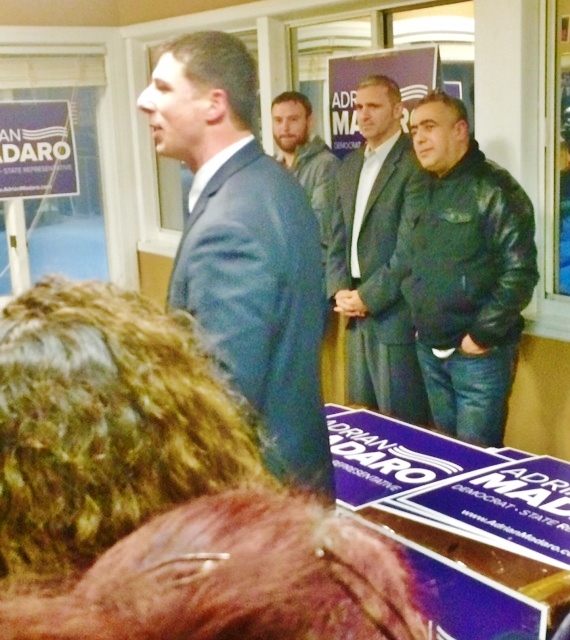 Madaro simply had the goods : he had the Eagle Hill neighborhood, in which he lives and grew up; and he was known and liked in corners of East Boston peopled by voters new to the neighborhood, voters with whom Ruggiero especially seemed less familiar. As i observed the campaign, Ruggiero, an Orient Heights Funeral Director not much older than Madaro seemed not, at first, to have broad support to match Ed Deveau’s, much less Madaro’s. It was a credit to his dogged hard work, likeable personality, and — evident everywhere — the power and hustle of Mayor Walsh and his followers that elevated the rather shy Ruggiero into serious competition. It would be interesting to have seen what more widely known Ed Deveau might have won had he, and not Ruggiero, been Walsh’s endorsee. But politics is not the arena of might-have-beens. Madaro’s win was a good night indeed for Carlo Basile, who is now Governor Baker’s appointments secretary, and it was a good nght or Baker himself. Unlike Mayor Walsh, Baker did not lead the charge for a candidate; yet there was no doubt in anyone’s mind that Madaro was Baker’s guy. On primary day the local forces of Team Baker knocked doors, drove voters to the polls, did what it took to get Madaro the win. As with most wins, Madaro’s was a coalition effort. Joining Team Baker were Mike Lake, who ran for Lieutenant Governor in last year’s Democratic primary, many supporters of 2013 Mayoral candidate John Connolly, and almost the entirety of East Boston’s non-union Progressives. Overall, however, it was Team Madaro’s entirely new generation of activists, a hundred of them : younger siblings of the millenials — who are no longer the new kids on the block. The campaign is not over. On March 31st Madaro faces independent candidate Joanne Pomodoro, whose expressed views — conservative and almost Tea party — on key issues differ entirely from his.